This is Hugme Christi, Lord Nelson’s “gal pal”. This week has been very somber with the passing of my second-half, Nelson. However, his life will live on in our memories and hearts. He loved being a professor at Rutgers and teaching people of all ages about horses and science. His legacy will live on through “Equine Science 4 Kids” and a memorial research fund dedicated to further “old horse” research at Rutgers. I truly want to know how that ol’ bugger lived to be 42 years old! 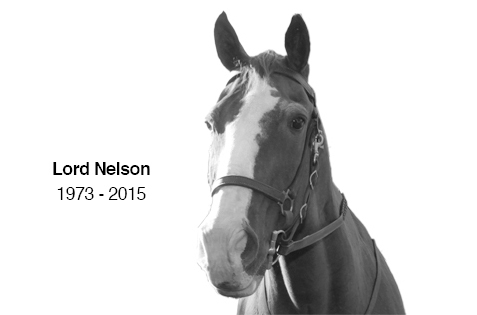 The Lord Nelson Older Horse Research Fund with further the research that kept him going for 42 years. Ag Field Day at Rutgers Day is just around the corner (Saturday, April 25) and what better way to pay tribute and celebrate his life than by joining the Equine Science Center at the Red Barn from 10 a.m. to 4 p.m. Nelson always hinted at making a guest appearance, but I think his spirit will definitely be there; after all, I heard there may be doughnuts there and you and I both know that he could never pass up anything sweet! At Ag Field Day, you can also personally meet JamaicaMeWild and Jolee, who might just do some writing for “Lord Nelson’s Blog”. They will also be a part of the treadmill demonstration, so be sure to come see them at 1:00 & 2:00pm (be sure to get there early, space will be limited)! Thank you for your out-pouring support and love for Lord Nelson. His work will continue with your help. And don’t forget to come out on Saturday, April 25 and devour some sweets in memory of Lord Nelson!